If you've ever wanted a full-sleeve tattoo but were to afraid to make that sort of commitment, we've got a solution for you! Our temporary full-sleeve tattoo is far more affordable than an actual tat and it doesn't hurt, either! 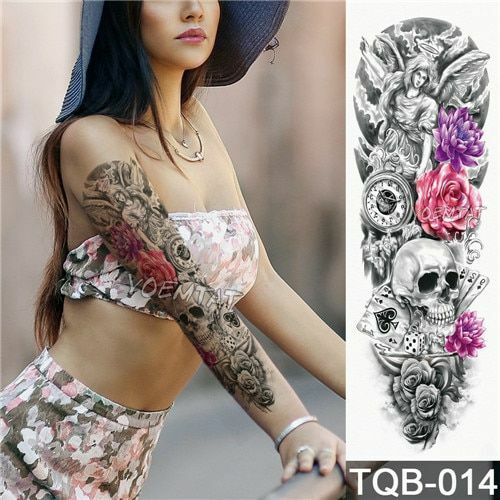 This amazing waterproof tattoo sticker will stay on until you take it off! You aren't stuck with it for life. It only takes about 30 seconds to apply. That's it! Decide where you want to apply the Tattoo. Make sure your skin is clean, free of oil, and dry. Cut out unwanted edges with scissors if desired. Remove the clear sheet and place your Tattoo on your skin face down. Wet the paper with a wet towel or sponge and wait 30 seconds. Carefully remove the paper to check if it has transferred. If not, press a little longer. Be sure not to twist or stretch the skin until the tattoo has time to set! Soak the tattoo with baby oil, olive oil, or rubbing alcohol for a few minutes, then scrub off with a cloth. BEAUTIFUL BUN MAKER - SALON-QUALITY HAIR FROM HOME! FinishingTouch - The Ultimate Hair Remover! BEARD STRAIGHTENING COMB - HELPS YOU LOOK YOUR BEST! GORGEOUS FOUR PIECE HAIR BRAIDING AND HAIR STYLING SET! 5-IN-1 EASY ELECTRIC HEAD SHAVER - GET A PROFESSIONAL CUT FROM HOME!